Holiday light experiences are all about creating Christmas memories. With the more-or-less-official arrival of the Christmas season after Thanksgiving, locations around the state turn into colorful, twinkling displays of lights. While Temple Square's decorations are one of the most popular holiday destinations—a tradition dating back more than 50 years—Utah becomes home to dozens of places hoping to attract visitors with illumination. But what draws folks, as though they were moths, to these beaming displays? For Richard Holdman—creator of the Christmas in Color drive-thru light experience—the simple answer comes down to family. A Utah Valley native, Holdman recalls getting in the car and driving to see the Temple Square lights when he was a kid. But he also credits his father's interest in home Christmas decoration with sparking his own ongoing fascination with holiday lights. "My father was always big into Christmas," Holdman says, "[and] would do an elaborate train set. And he really loved Christmas lights. We came from a big family, and we always helped. I hated putting them up, but when they were up, they were awesome." It wasn't always obvious, though, that this interest would carry over into adulthood. Holdman recalls that, when he had only been recently married, his wife suggested putting up lights. "I thought, 'Uh, I don't know,'" he says. "When I get into doing something, I always go overboard. Either I'm going to do no lights, or a lot of lights." The "lot of lights" concept only got bigger for Holman in 2005, when he saw a video of someone who had created an elaborate animated home Christmas lights display set to music. For much of the next year, he prepared for his own home arrangement, creating a showpiece set to "Amazing Grace" that became a viral YouTube sensation. "I come from a family of artists," says Holdman, whose own professional background at the time was in IT. "What I loved about animating lights was I loved art and I loved technology, and this was a way to combine them." Inquiries about his work after his videos hit the internet have since turned his hobby into a full-time job, including creating displays in Moscow, South Korea and South America. 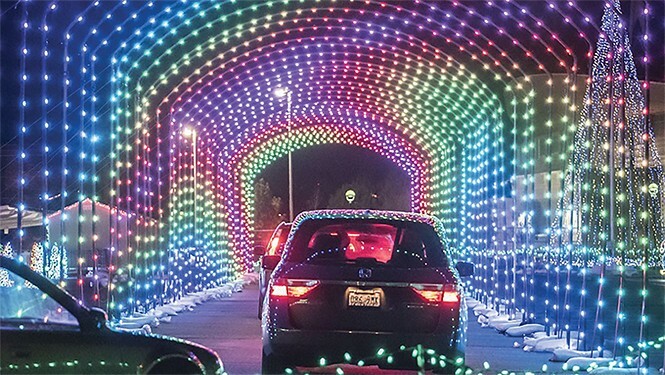 Now in its third year, Christmas in Color has two Utah locations—Provo and South Jordan—for visitors to tour through acres of lights, all accompanied by holiday music played on the car's radio. "Everybody's seen Christmas lights throughout their life," Holdman says. "What really impresses people is a lot of Christmas lights. And when you bring an element of animation into it, they're doing something people have never seen." Yet Holdman also recognizes that reminding people of what they have seen is a big part of the experience, which is why he doesn't change the display much from year to year. "One thing I found out is, people like traditions," he says. "Christmas is a very traditional thing. I'd do new music, and people would say, 'Oh, I really liked the music last year.'" The appeal of tradition is also clear to Erica Hansen, community outreach coordinator for Hogle Zoo. 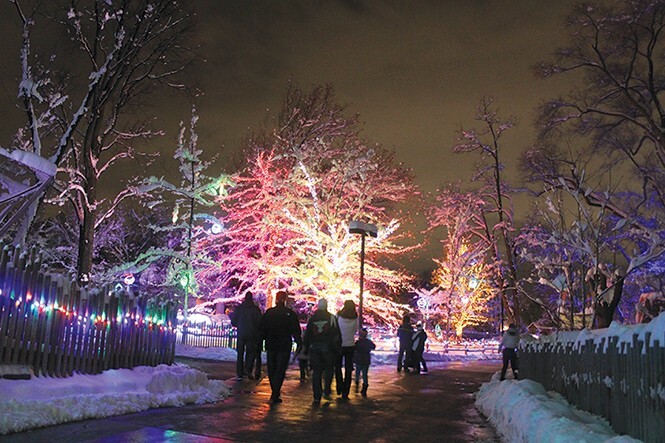 Now in its 11th year, the zoo's annual holiday ZooLights have already become something of a tradition—although Hansen notes that part of ZooLights' origin was the inaccessibility of another local tradition. "City Creek was under construction," Hansen says, "so a lot of downtown holiday stuff was a little harder to get to. Attendance for us is a pretty hard and fast bell curve [focused on the summer months], so we try to get people to come other times of the year. It was time to dip our toe in the water, but we were overwhelmed by the response." The zoo's light display includes both stationary lights and animated features like animals, plus additional family-friendly attractions like a fire pit for making s'mores. Hansen says it's important for the event to remain affordable, as part of the zoo's "gift back to the community," and notes that an event of this kind becomes part of memorable moments shared by families. "I really think that, in this market, it's about time with family, creating Christmas traditions and memories," Hansen says. "We all grew up going to see lights, and you want to share that with your kids." That generation-to-generation connection is certainly one Holdman recognizes as well. "We hope to become a tradition for people," he says. "That's what it's all about, is making memories. The reason why we have traditions is you experience all these good times, and when you re-experience it, it brings back all those memories from previous years."